So how do you actually build a wireless Wi-Fi network? It depends a little bit on the scenario, but the basics are always the same. First let’s discuss what most people might do, and which problems that might lead to. Most people will probably either receive a home router with built-in Wi-Fi from their Internet Service Provider (ISP) as part of the service, or they will buy a home router with built-in Wi-Fi on their own. Then they place the router somewhere close to where the Internet Connection is delivered. It might be in the living room by the cable TV jack, by the phone jack in the kitchen, or by the fiber converter box in the hallway. But since the Wi-Fi router is often in the way and people think it is ugly and doesn’t fit the rest of the interior design they choose to hide their Wi-Fi router. Maybe underneath a TV table, behind a cupboard or lying down on top of a shelf. Often they then get bad Wi-Fi coverage in general. Especially in other rooms further away in the house. If you have a second floor then the coverage might be even worse up there. But since you just have a single router which might be difficult to move away from where it is currently installed people don’t know how to solve the issue. Some might have googled for a solution to extend their wireless network coverage area. They might have stumbled upon solutions including buying yet another Wi-Fi router that they connect to the first router using a network cable. They place the second router on the second floor to improve the coverage up there. Or they might buy a Wi-Fi repeater that they install. What they don’t know is that there are a whole lot of reasons for why those are less than optimal solutions and that the solutions themselves are creating other types of related problems. The end result is often that people are dissatisfied with their wireless network and think that it works bad in general. Here we look at a few common solutions for building Wi-Fi networks. A repeater is a special type of wireless device which is sort of a mix between an access point and a client. If you have bad Wi-Fi coverage in a part of your apartment because the signal can’t reach that far, then you could put a repeater halfway there. 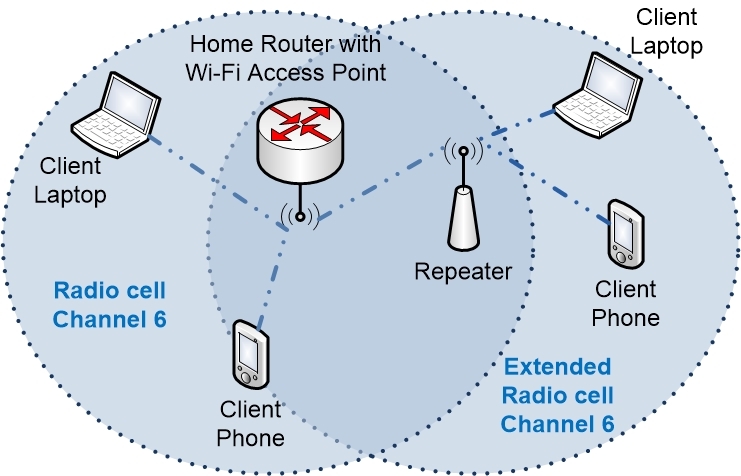 The repeater will connect to the wireless network (acting as a client) and will extend the signal by repeating the signal to the clients further away (acting more like an access point). The first thing you should know is that a repeater is avoided by anybody who works professionally with wireless networks. It is a makeshift solution that might look good on paper if you don’t know how it works, but if you do understand how it works then you also understand why it is a bad solution. First of all you are going to extend the signal with the help of the repeater. The repeater doesn’t have any better reach than the Wi-Fi router. So to extend the signal from the access point by 10 meters you have to put the repeater something like 10 meters away from the access point. If you put it too far away then the signal from the access point gets too weak. If you put the repeater too close then the signal from the access point isn’t really going to be extended by much. But the further away you put the repeater the worse signal it will receive from the access point. This also means that the throughput drops which limits the maximum connection speed of anybody who connects to the repeater (remember, the speed decreases the further away you get from the access point). Wireless networks are Half-Duplex. Only one device can talk at a time. So when the repeater is re-transmitting the messages that it receives then everybody else must be silent. Each message going back and forth between the original access point and the client connected to the repeater will in effect be transmitted twice, which takes time during which all other clients must be silent. Since both the repeater and the client laptop are probably further away from each other with worse signal quality they have to lower their transmission speeds, causing the whole network to have to wait even longer for them to communicate. Anything that the client says must be repeated by the repeater. So in effect any client that is connected to the repeater will automatically have their throughput almost cut in half. The repeater will extend the wireless network all the way to the client that previously had bad coverage. 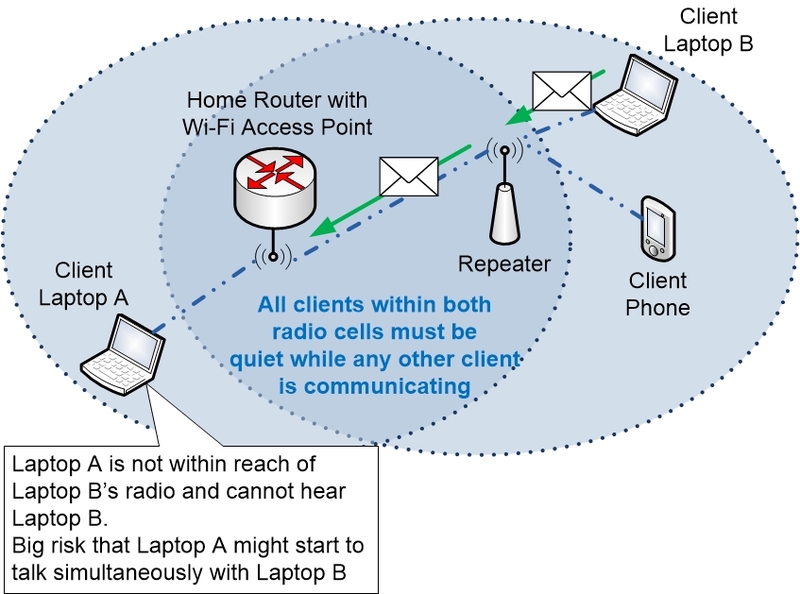 But clients that are connected to the repeater in the extended area might not be able to hear if a client that is connected to the Wi-Fi router far away in the other side of the house is talking. This causes the mechanisms for how wireless clients try to avoid collisions to become less effective, which causes collisions to occur more often, which causes more communication downtime and lower throughput for all of the connected clients. So even if a repeater solves the immediate problem of trying to extend your wireless network to an area further away the solution has lots of problems. The only real benefit of using a repeater is that you do not have to run a network cable from your home router to the repeater. It can talk wirelessly to the Wi-Fi router. If running a cable between your router and an additional access point is your main concern then you could look at solutions based on HomePlug to see if that could be a viable option. HomePlug is a system for communicating over the existing electrical grid that is already installed in your home. The bottom line is that you shouldn’t use a repeater unless you really have to for some reason. Your wireless network will be limited by your repeater based solution. Some people who notice that they have Wi-Fi coverage issues at home solve the problem by adding another home router with built in Wi-Fi to their network. Remember how a home router is built up? It has a WAN port (outside) and one or more LAN ports (inside). The built in access point counts as if it belongs to the LAN. So if you connect the WAN port of a second home router to one of the LAN ports of the first router, then you have created a new small LAN segment which is separate from the first one. This means that clients that are connected to the different home routers will have trouble talking with each other. In the picture above, devices that are connected to Home Router A will go through a NAT address translations when they talk to the Internet. Devices connected to Router B however must first pass through NAT address translation on Router B, and then they must pass through yet another address translation in Router A to get to the Internet. 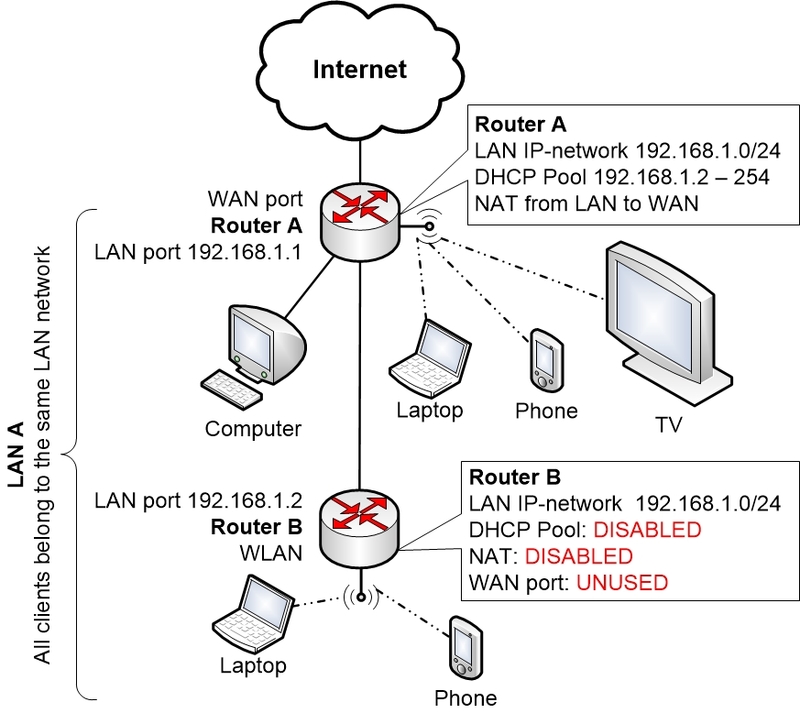 Since Router B is using NAT, then devices that are connected on the outside of Router B can’t communicate to devices that are connected to the inside LAN of Router B. To be able to do that you would have to add Port Forwards on Router B, which quickly gets really complex to work with. One problem that this causes is that a lot of solutions today that stream music and video require that devices are connected to the same Wireless Network. Apple TV, AirPlay and Google Chromecast all require that the devices are connected to exactly the same wireless home network. Otherwise they cannot connect to each other. In the solution above where you add a second home router you actually have two separate wireless networks on two separate routers. So things like AirPlay, Chromecast, Steam In-Home Streaming and similar might not work as expected, or at all. You can also have issues if a wireless client connects to the “wrong” wireless network. If you have an Apple TV connected to the Wi-Fi router in the living room, but your mobile phone is connected to the Wi-Fi router on the second floor, then you can’t stream music or film from your mobile to the Apple TV. The only way to solve this would be to try to make your mobile jump over to the “right” wireless network. Maybe by disabling the Wi-Fi in the mobile phone and then enabling it again to try to make it connect to the closest Wi-Fi router with the best signal. So having two home routers with separate LAN networks and two separate wireless networks will cause all sorts of problems with your home network. There is actually something you could do to improve the above situation considerably. The solution would still not be perfect, but far better than above. If you disable both NAT and DHCP in the second home router, and then connect a network cable from a LAN port of Router A directly to one of the LAN ports on on Router B, then you form a shared LAN segment between the two routers that all clients will belong to. You also have to change the IP address of router B’s LAN port to avoid having IP address conflicts, and you must make sure that their IP addresses are on the same IP network. This would at least prevent the two routers from belonging to two separate LAN networks. Instead they will have a common shared inside LAN IP network between them. Since only Router A is handing out IP addresses via DHCP then all clients within the whole home network will have Router A as their default gateway. Hopefully Router B that you use in this solution will let wireless clients that connect to Router B obtain an IP address from the DHCP pool on Router A. 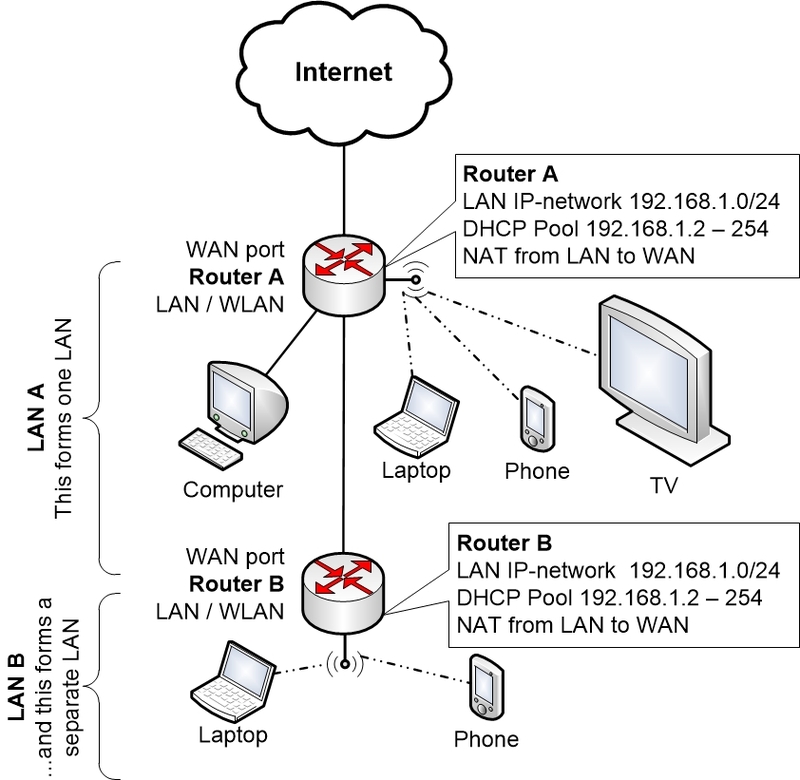 Otherwise you will have to keep a DHCP pool active on Router B as well, but you must make sure that both of the DHCP pools (in Router A and Router B) hand out IP addresses within the shared LAN segment between the routers, and you must also make sure that the addresses in the DHCP pools do not overlap. In addition you must configure the IP address of Router A as the default gateway address in both pools. As you can tell even if this solution would improve the situation there is a lot of work involved, and the end result is still not perfect. The solution also depends on what settings that are available in Router B. But if everything works then it is a cheap and effective solution to a common problem!